Frome’s big Christmas lights switch on! 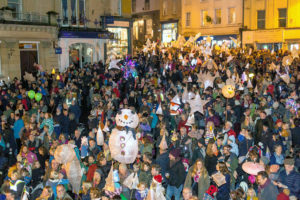 Thousands of local residents gathered at the weekend to celebrate the start of the festive season with Frome’s annual Christmas Lights switch on. 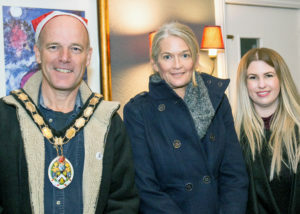 The night saw the whole community gathered together to watch the Mayor, cllr Richard Ackroyd and his special guests, fundraising stars Rachel Clark and Lisa Wells, push the plunger to light up the town’s Christmas tree. The area around the Boyle Cross hosted a variety of performers starting with children from Selwood Academy getting bystanders in the Christmas spirit, followed by Rock Choir’s festive set and then Rare Species made sure everyone was moving and laughing with Mojo Moves. Then it was time for the magical lantern parade led from St John’s Church to the centre of town by the lively Jamma de Samba. The lanterns, ranging from angels and stars to Santa’s sleigh and Rudolph himself, had been organised thanks to Mel Day and Aliss Vaas from Night the Light, supported by Frome Town Council, hosting free community workshops over the last few months.